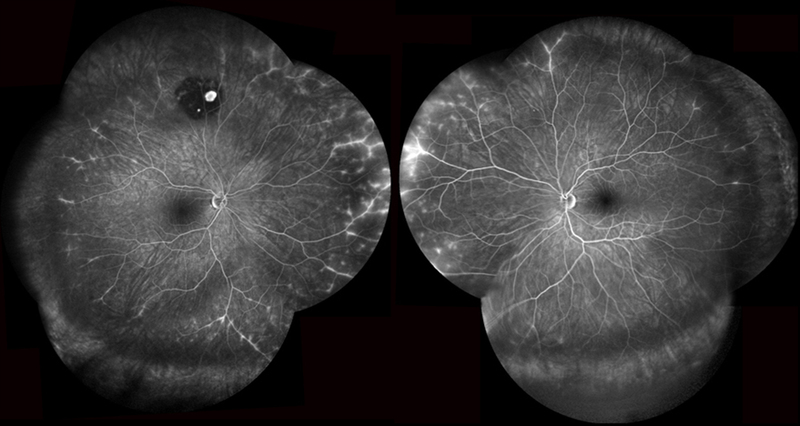 These retinal images are from an 84 year old white male who presented to the Moran Eye Center in 2008. 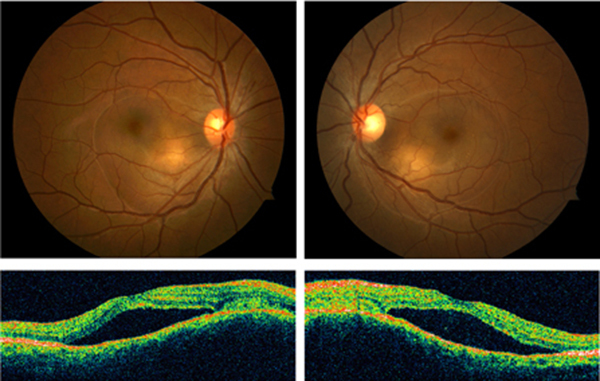 He was diagnosed and followed for dry age-related macular degeneration (AMD) with serial autofluorescent photographs showing progression of geographic atrophy of the RPE from 2008 to 2014. These images were prepared by James Gilman of the Moran Eye Center. This is a 58 year old white female with a retinal astrocytic hamartoma on her right optic nerve. Retinal astrocytic hamartomas are glial tumors of the retinal nerve fiber layer arising from retinal astrocytes. This animated GIF file illustrates the height of the hamartoma and is another example of where animated gifs can be a fantastic teaching tool. The left and right stereo images shown were taken with a Zeiss FF-4 Fundus camera by James Gilman of the Moran Eye Center. 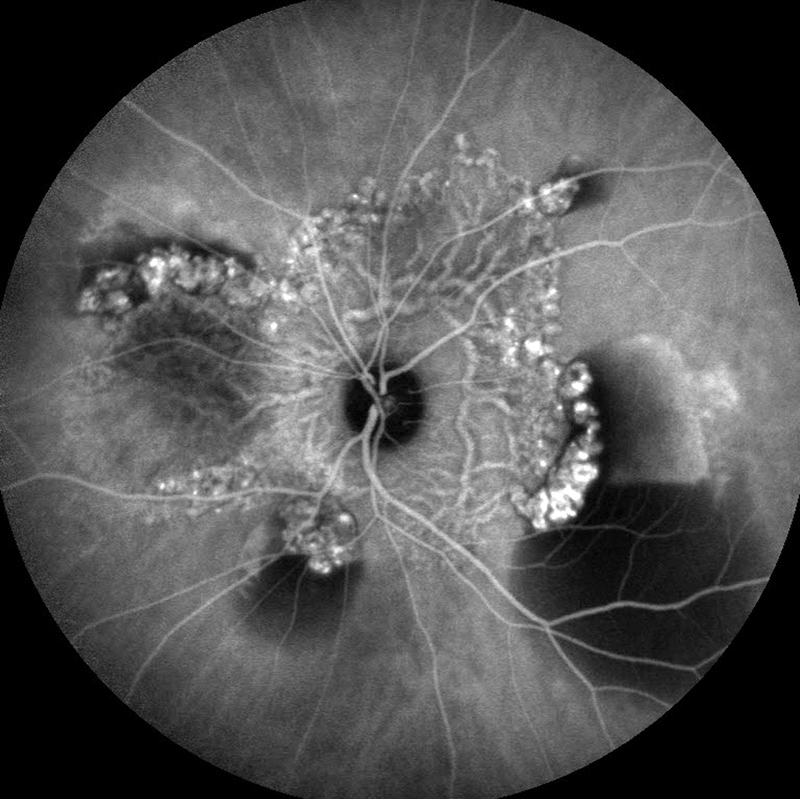 We had a recent case of Polypoidal Choroidal Vasculopathy here at the Moran Eye Center, imaged here as an ICG angiogram (large image here). 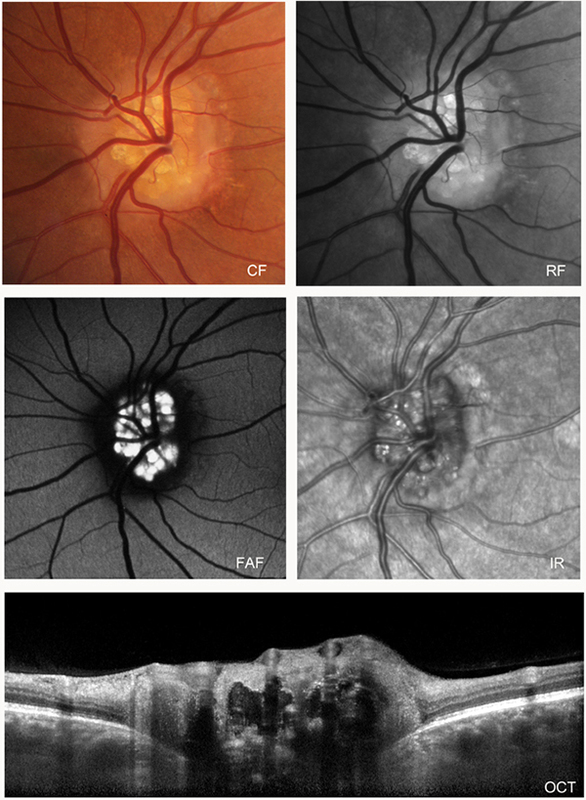 Polypoidal Choroidal Vasculopathy is an uncommon disorder of the choroidal circulation summarized in the Ciardella et. al. paper Polypoidal Choroidal Vasculopathy. ICG angiogram provided by James Gilman of the Moran Eye Center. Drusen in the retina is a common finding in aging retina, forming deposits in the retina between Bruch’s membrane and the retinal pigment epithelium. Most people over 40 start to accumulate some drusen, but increasing amounts of drusen formation can indicate pathological developments associated with age related macular degeneration, (AMD). Cristine Curcio has been chasing mechanisms of drusen formation over the years and has the best model for drusen formation that I’ve seen. Optic nerve head drusen (ONHD) or optic disc drusen (ODD) occurs rarely in the population, about 1% of the population, though there seems to be a genetic association as in families with a history of ONHD, it increases to almost 3.5% of those families. In todays Grand Rounds on Webvision, we have a classic case of ONHD with typical fundus photographs, but also red-free, autofluorescence, IR and OCT captured by James Gilman of the Moran Eye Center. 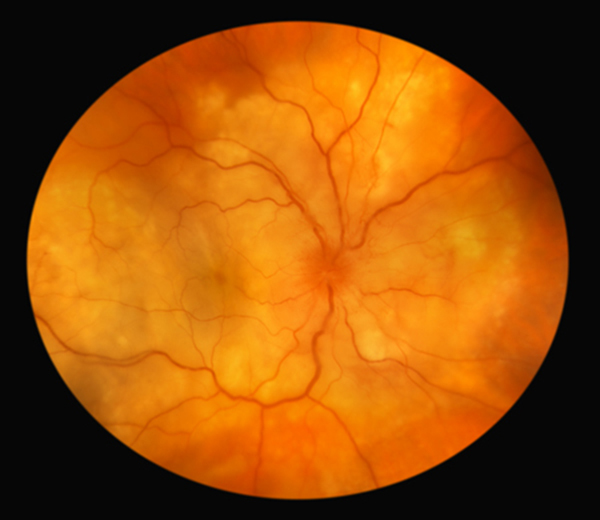 A color fundus photograph (CF) shows discreet multiple yellowish calcium deposits in the optic nerve head. The Red-Free photograph (RF) reveals clearer outlines of the drusen. The Fundus AutoFluorescence photograph (FAF) shows the highly fluorescent drusen in this patient’s optic nerve. The infrared image (IR) shows small discreet reflective bodies in the optic nerve. The OCT image (OCT) shows very dense round inclusions in the optic nerve that shadow the OCT signal and indicate the shallow depth and geographic cluster of the drusen. This photo (enlarged image) shows peripheral vasculitis in a patient with Acute Zonal Occult Outer Retinopathy (AZOOR). 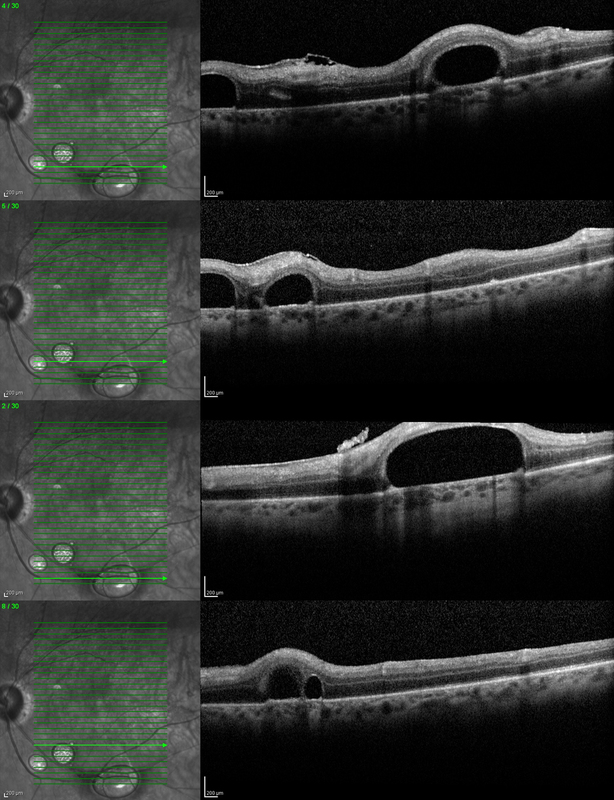 Five images were taken in each eye and composited together to show the peripheral changes taking place in the mid arterivenous phase of the fluorescein angiogram. This image was made by James Gilman of the Moran Eye Center using a 102 degree non-contact wide angle lens on a Heidelberg Spectralis. Vitreoretinal lymphoma is a form of central nervous system (CNS) lymphoma that often is misdiagnosed as uveitis, but is the most common form of intraocular lymphoma. 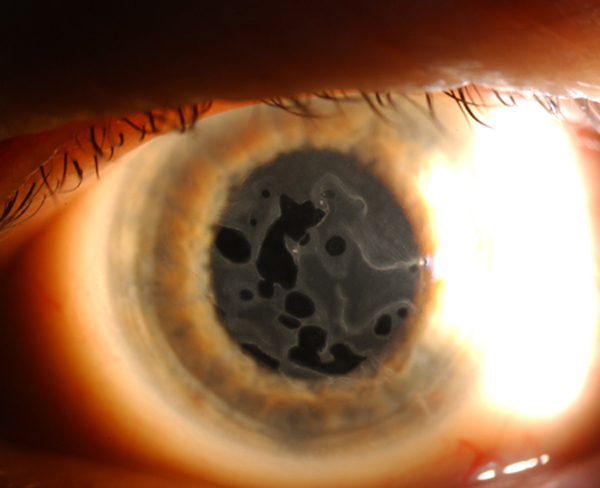 A proper diagnosis of vitreoretinal lymphoma requires the histological identification of lymphoma typed cells within the vitreous of the globe or retina which can be a trick due to reactive lymphocytes as well as necrotic regions in the retina. Contemporary approaches also require immunohistochemistry to reveal the monoclonality. This rare form of lymphoma commonly has a poor prognosis and is often associated with a CNS lymphoma in aged populations. That said, historically treatment, like other retinal cancers was commonly enucleation. These days, chemotherapy combined with radiation therapy is more commonly used, though without good outcomes in many cases due to the difficulty delivering drugs into the eye from systemic administration. New approaches are being explored through the direct injection of drugs into the globe and those efforts are ongoing. Fundus photos were made by James Gilman of the Moran Eye Center. This imagery is from a patient with Vogt Koyanagi Harada Syndrome (VKH). 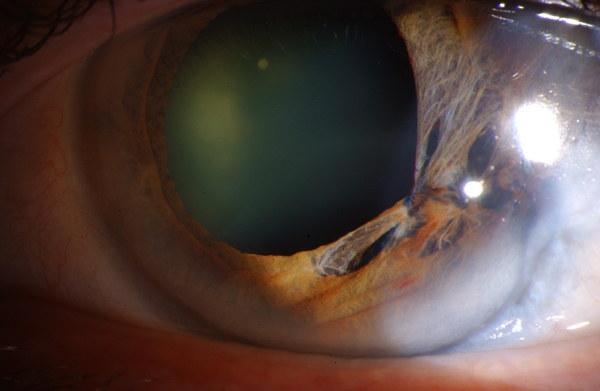 VKH is a presumed autoimmune disease that presents with waxing and waning subretinal fluid. There is chromic uveitis with other neurological and dermatological symptoms. The precise mechanism of the disease is unknown, though it is thought that the autoimmune involvement of melanocytes in the uvea, skin, inner ear and CNS is mediated by T helper cells. 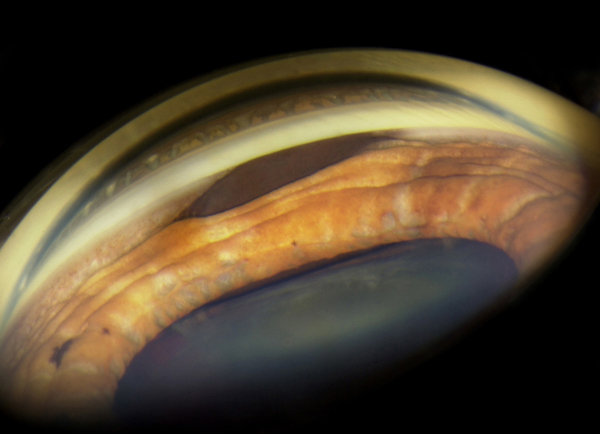 The fundus photos above show the discoloration of the retina from fluid and the corresponding OCT below, shows the dark areas of fluid infiltration. Fundus photos were made by James Gilman of the Moran Eye Center and taken with a Zeiss FF-450+ and the OCT with with a Zeiss Stratus. Grand Rounds for today is an interesting finding of an anomalous congenital blood vessel that crosses the front of a pupil, relaxing when the pupil is small, and pulling taut when the pupil becomes is dilated. The image above is relaxed with a small pupil. Images graciously provided to Webvision by Cyrie Fry of the Moran Eye Center. 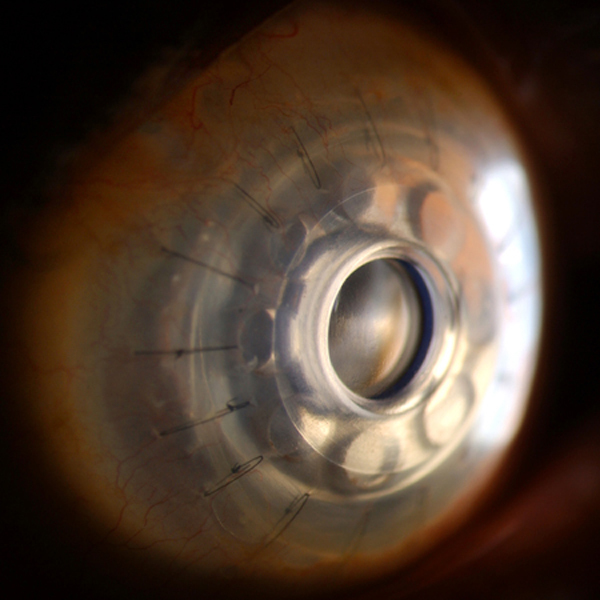 This image is from a patient has a keratoprosthesis or artificial cornea. 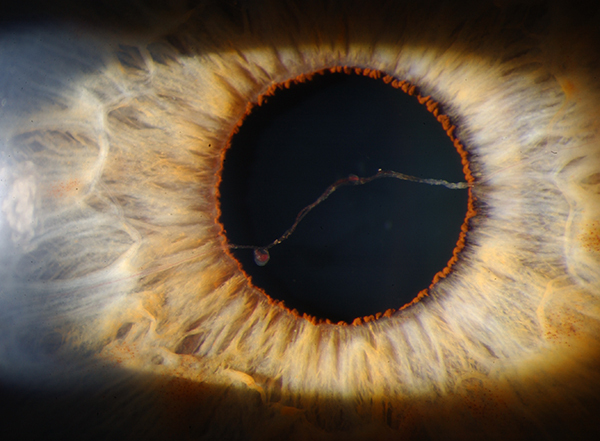 Photograph was made by James Gilman of the Moran Eye Center using a sclerotic scatter illumination with a Zeiss photo slitlamp and a Nikon D-1X camera. 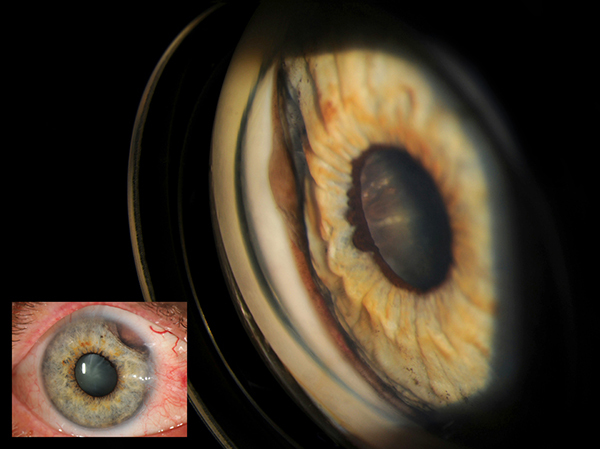 This image demonstrates an iris tumor that is sitting in the angle. 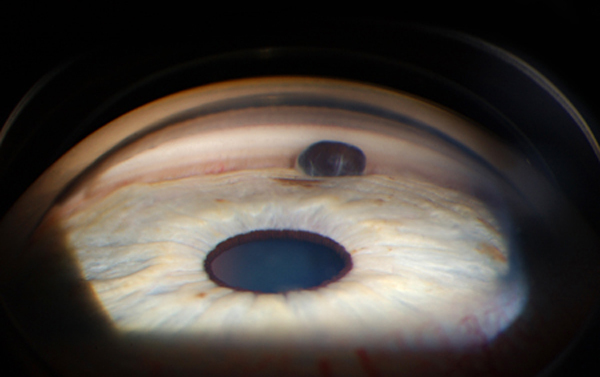 Photograph was made by James Gilman of the Moran Eye Center using a Goldmann 3-mirror lens scatter illumination with a Zeiss photo slitlamp and a Nikon D-1X camera.